Ling, also known as fresh water cod, are probably one of the most prolific species that one can plan to target in the cold, deep northern lakes of Ontario. These fish are primarily a nocturnal feeder. They live deep, very deep, and at night they slither their way up from these depths seeking forage in shallower areas. They will continue to feed right through the night, providing tons of action for you and your fishing buddies for many hours. Burbot are very easily caught through the ice on lakes that support the species. Your primary time to target ling should begin at dusk. These eel like fish will begin to emerge from the depths and move to shallower locations to feed. 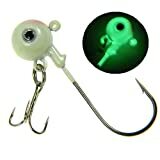 Tip a glow in the dark jig head with a minnow. Drop the jig to the bottom and let it sit still. If ling are present, it shouldnt take long for you to see some action. Often the action comes just as the sun sets. Takes might be very subtle, with the rod tip just barely moving up and down. On the other hand, takes can be quite violent at times. Be sure you are close by your rod or you might lose it if an aggressive burbot decides your offering is dinner. Aside from their enormous populations in most northern lakes is the fact that these are one of the tastiest fish species available to be angled through the ice in northern Ontario. Once you’ve tasted some fresh battered and fried ling, you’ll quickly realize why they’ve come to be called “poor mans lobster”. Watch the video below for some great tips from Tim Smyth of Mad Fisher Media on how to target this easy to catch fish while ice fishing. This fishing tip is provided by Daily Fishing Tips and was filmed at Tamar Vacations, a Temagami Ice Fishing Destination. 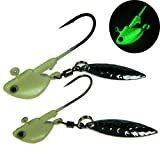 Posted in Burbot/Ling, Species and tagged burbot, cod, freshwater cod, glow in the dark lures, jigs, ling, minnows. Providing information about Ice Fishing in Ontario. Where to fish, what to use. Ice Hut and Bungalow operators on Lake Simcoe and Lake Temagami. 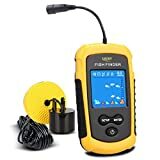 Ice Fishing Derby dates, gear and lure reviews. Ice Fish Ontario may use affiliate links in our posts. What this means is if you click on one of the product links in our posts, we might receive a small commission. This commission helps us pay the bills for our website maintenance and video production. Since we are not paid or sponsored, your support is appreciated. We are a participant in the Amazon Services LLC Associates Program, an affiliate advertising program designed to provide a means for us to earn fees by linking to Amazon.com and affiliated sites. We only link to products we use and believe are beneficial to ice fishing related activities.